I did it! I finished a UFO! Woohoo! Here is my finished Granny Square quilt. I caught the granny square bug almost immediately when these first started popping up over blog land and lure proved too strong for me to resist. No. I didn’t need another project by any means. Yes. I had to push myself to finish this. I was all worried about color bleeding on this one, but it turned out that I needed to be worried about fabric fraying. 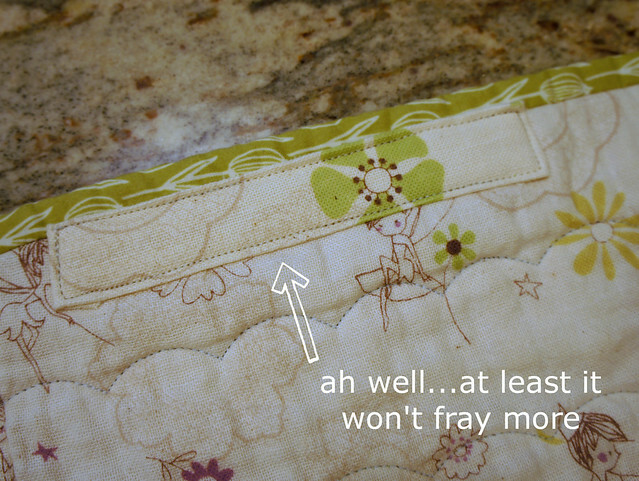 This has never happened to me before with a quilted finished piece, so I had to do some thinking about how to fix it. After considering a number of options, I decided to simply create a patch. I had to make sure that fabric would not continue to fray. I have a micro shot of the patch here but it actually blends in pretty well when looking at the whole quilt. The nice thing about the gauze is that it is pretty forgiving ultimately. I may throw a little label over that patch just to make it feel more deliberate but we’ll see if I get the inclination between now and tomorrow night. It’s headed off to a new home and a new baby girl. The quilt was definitely Caitlyn approved, so hopefully this soon to be baby girl will one day love the quilt too. Gorgeous! and the quilt is lovely too!!!!! what a gorgeous quilt. I love the addition of that Japanese gauze, and you fixed it really well, too. Wooo, good job! I love the cornerstones that you put in the sashing, it looks great! i just love the variance between the sashing and the border–so fabulous! what did you use for sashing? Kona ash? LOVE your quilt, a fabulous example of a Granny! Great colour combos. So beautiful! I love the patch solution. It`s just fabulous and love your color choice,beautiful!! It's a pretty quilt, flaw or no flaw. You did a good job of covering that up. I'm sure the recipient will love it! It's really pretty, Angela! Sorry about your mishap with the gauze fabric, but your fix is just fine. I completed my Great Granny quilt top this week and I'm ready for basting when the backing arrives in the mail. I have some detailed ideas about how to quilt it, but will see what actually happens! Hold on there sister. Was that a pregnancy announcement?? I have been behind on the blogs, maybe you already mentioned it?? And that is about the cuddliest looking quilt ever!! lol! NO! This is going to a good friend of mine who is having a baby girl soon. i vote turn it into a patch. just stamp some words on there and it will look totally deliberate! genius. this is why I keep you around! Stamps! It's absolutely gorgeous, Angela! Even the patch!! Yay! It turned out SO great! I love it. I have really meant to get on the Granny Square band wagon, I just haven't quite yet. So lovely!! I adore the bright colors against the neutral background. I also really like the fussy cut squares in between the blocks. Clever!! Your quilt is gorgeous. I love the corner stones between the sashing. I'm not sure if that's what they are called but I love them anyway. 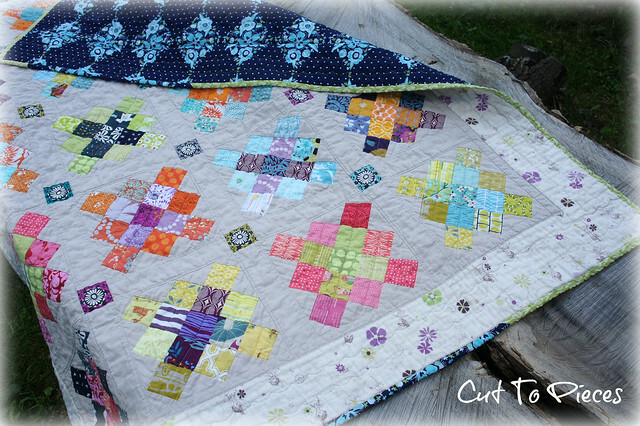 While I am smitten with the design and the finish, what I love most is how you used stash and stash and more stash and that you let that stash drive the quilt's design to its final place. I ♥ the buzz from using what I have and making something that not only accomplishes stash busting but looks beautiful to boot. You did that! I love it!!! I need to finish my Great Granny quilt and now you've inspired me to get back to it! I love your quilt . I've been admiring these in blog land for a while now ……but yours is definitely making me think I might like to make one too . It's gorgeous . I have lots of scraps too . So cute! The backing and binding are great and I love the sashing blocks too! Congratulations on the finish, Angela! I actually took stock of all my WIPs and UFOs last week and was horrified to find I have no fewer than 25 projects going. That doesn't even count VQB blocks. *sob* Guess I need to get serious about the UFO plan again. I love it, and it gives me two ideas to try (like I need more, right?) 1: Use a lighter color border than the sashing because it provides a cool contrast, and 2: Find mini-medallions to fussy cut for squares in between the sashing. Bravo!! My Granny Square quilt top and back have been ready and waiting for quite a while to be quilted. looks absolutely gorgeous! congrats on finishing! 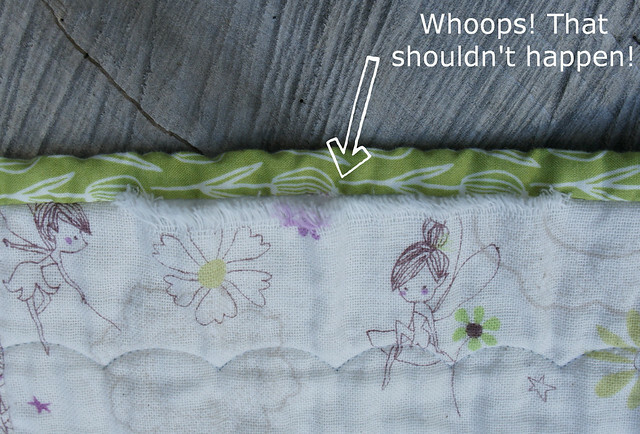 Yep, that's what happened to me with the FFA double gauze on Aria's Fairytale Patchwork quilt. Naughty gauze. Your patch looks great. Don't give it another thought! Your quilt is beautiful! And the patch looks GREAT too! Great fix to a minor problem. Glad to know these things happen to you too! 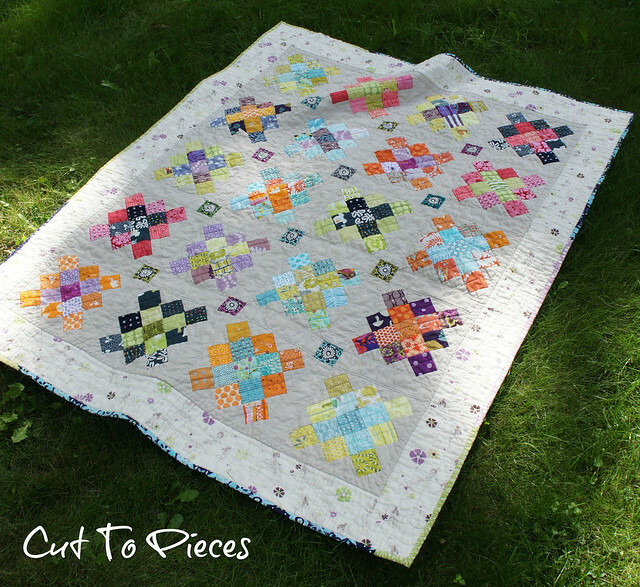 The granny square quilt is a beautiful finish. Such a sweet little quilt! Congratulations on a fantastic quilt. This is exceptionally pretty! Little mishaps really bring out the creative thinking. That in itself is so rewarding, don't you think? I love the look of the linen but am terrified to try using it. 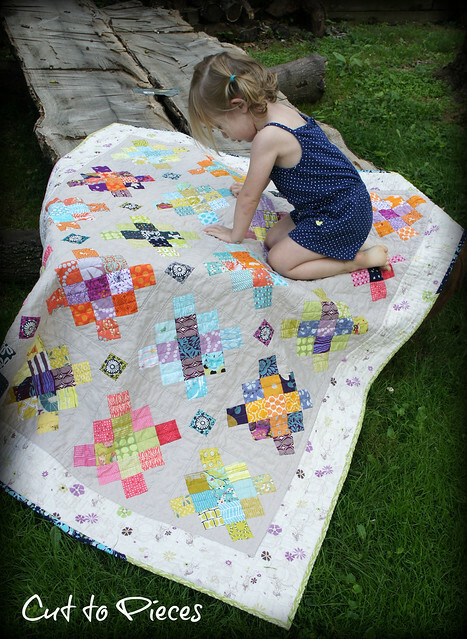 This quilt is amazing and thank you so much for posting about the fraying! I had the same thing happen and I've been wondering what to do about it (especially since I didn't notice it until after I got the binding on and I've ripped stitches out like maybe 10 times so it's just going to have to stay on haha). So thank you! I'm going to put a patch over it and a label. Not where I usually put a label but oh well. 🙂 I feel so much better. I love your quilt, but I really love your border, fits perfectly! Angela, I think a label over the patch is a great idea as a way to secure the fabric that wants to fray and having a lovely quilt with a personalized label so that in the years to come, they will remember whose loving hands made this for the fortunate owner. So very pretty. Great finish! I like it a lot, too. Makes me want to finish my miniquilt, too. What's up mates, good piece of writing and fastidious arguments commented here, I am genuinely enjoying by these.